Doctoring Rewinding Machines Manufacturer to make doctoring process for your flexible Packaging Roll with high-quality equipment. Doctoring Rewinding with more than 25 different models to choose from with high-quality performance. Like: Standard Doctoring Rewinding Machine, Table Top, High Speed Doctoring Rewinding, Heavy Duty Doctoring Rewinding Machine with Slitting System, Winding Rewinding With Multihead Inkjet Printer, with Thermal Transfer Overprinter, Label Stock, Special Application for Doctoring Rewinding, Doctoring Film Strip Winding Rewinding, Coil Winding, Inspection Doctoring Slitting, Film Winding Rewinding for Batch Coding, Doctor Re Reeling and many more per client’s requirement and application. Cantilever design balancing body for easy loading and unloading of parent / rewound reel. 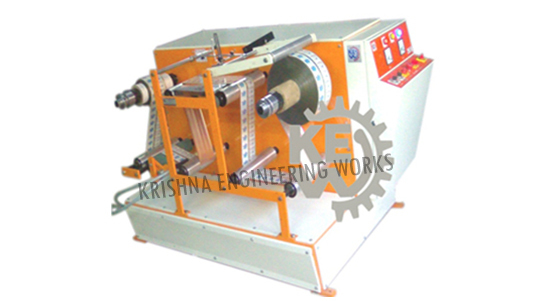 Movable unwind stage for Edge guiding System (Hydraulic Web Aligner) in Doctoring Rewinding Machine. High-quality Doctoring Rewinding, Heavy duty Doctoring Rewinding, Standard equipment for various types of Doctoring Rewinding, 25 different types of Doctoring Rewinding, Doctoring Rewinding with a unique application, Doctoring Rewinding per client’s requirement, Doctoring Rewinding for various types of Industries. Mechanical 1.5 / 2.5 Kg. Optional Magnetic powder brake with tension controller & Torque control potentiometer. Provision for incorporating Ink Jet Printing System with Hot air ink drying in Doctoring Rewinding Machine. The Model is specially designed for correcting badly wounded reels for inspection & doctoring operation. It is great substitute to online coding / batching operation in Doctoring Rewinding Machine. Max Parent Reel dia. : 400 mm. Copyright © 2019 tyrecordmachinery.com All Rights Reserved.